BRP Hot Rods: Hose and line kits BRP Hot Rods.com - conversion kit specialists for GM vehicles. Power Steering Pump to Steering Box hose kit. Includes everything you need to go from the new style LS power steering pump to both the early and late style steering boxes. Black covered stainless steel braided high pressure supply line and nylon premium race low pressure return. 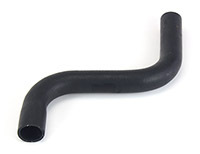 Vehicles using the original power steering (slave cylinder) will need this additional fitting to connect the power steering hose to the slave cylinder. If you have converted to a late model steering box (such as the Delphi 600 Series) you will not need this fitting. Works well when using one of our radiators with the inlet on the passenger side. Also works well in tighter engine compartments. Works well when using a factory radiator with the inlet on the driver side. Also works well in larger engine compartments especially when using the Corvette water pump. Works well in tighter engine compartments and when it is tight against the frame rail. Works well in larger engine compartments. This kit will work with Power Glide, TH350, TH400, 200R4, 4L60E and 4L70E transmissions. Includes everything you need to go from the transmission to the radiator. Black covered stainless steel braided high pressure hose with all the correct fittings. Transmission Cooler Line kit specifically made for the 4L80E and 4L85E transmissions. Transmission Cooler Line kit specifically made for the 6L80E, 6L90E, 8L80E, and 8L90E transmissions. Includes a billet transmission manifold to connect to the transmission.